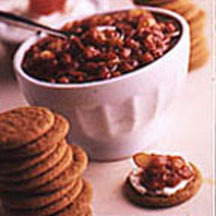 This terrific strawberry chutney recipe was submitted by Edwina Gadsby of Great Falls, Montana. Combine the first 8 ingredients in a large non-aluminum saucepan; bring to boil. Cook, uncovered, over medium heat 15 minutes or until slightly thickened and syrupy, stirring frequently. Add strawberries; reduce heat, and simmer, uncovered, 10 minutes or until thickened, stirring occasionally. Remove from heat; stir in almonds. Spoon into a bowl; cover and chill. Serve with nonfat or light cream cheese and gingersnaps. Garnish with strawberry fans, if desired. Recipe and photograph provided courtesy California Strawberry Commission. ©2003 California Strawberry Commission. All rights reserved. Used with permission.